Q&A: No Telescope? No Problem. Answer: You can do real astronomy using only binoculars. In fact, you can do real astronomy using only your eyes. And there’s a strong argument to be made for doing exactly that, before you even think about buying a telescope. Too many people spend their money on expensive equipment before they know if they even like astronomy. Finding your way around the sky, recognizing the major stars and constellations, learning the patterns of motion over time, all this can be done without the aid of instruments. This is how astronomy started thousands of years ago. Galileo didn’t invent his telescope until 1610, and by that time a lot of astronomy had already been done. A lack of magnification does not exclude you from pursuing this hobby. Of course, the bigger and better your binoculars or telescope, the more you’re gonna see. “Cheap” binoculars will not show you all the details seen above. There are many ways to learn more about astronomy at all levels. Public libraries and the internet provide a wealth of information for beginners, but the best place to start is a local astronomy club. Listed above are the four major clubs in your area. Visit their websites, and see which one sounds right for you. They’re all excellent, but each club has a different focus (no pun intended). They all welcome beginners. 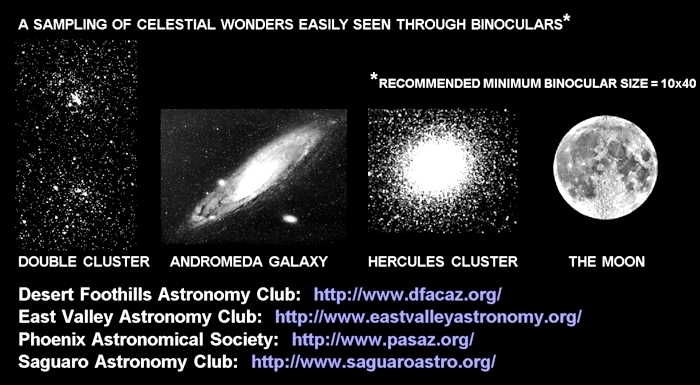 Astronomy clubs are a great way to meet other people who share your interest. They can help you learn more about what is, in my humble opinion, the best hobby in the universe.